On-Ear Headphones or Earbuds for Your Workout Headphones? Which type is better for workout headphones? On-ear or earbuds? There are so many types of headphones and it’s hard to know which ones are the best for your needs. Learning more about it is always a good idea and you’re in the right place to do exactly that. Here we’ll answer all the questions regarding on-ear workout headphones and how they compare to smaller, in-ear workout headphones (earbuds). What kind of on-ear headphones are good for sports? Check the table-of-contents for more direct links. On-Ear Headphones vs In-Ear Headphones (Earbuds) – Which are Better for Working Out? On-Ear Workout Headphones – Are They Any Good? What are the Most Comfortable Headphones for Working Out? What On-Ear Headphones are Best for Working Out? If you want to do any serious exercise, like playing tennis, yoga or lifting weights, you need your workout headphones to stay put. They have to stick to your ears like glue to withstand the strong forces during a workout. Generally, in-ear headphones or earbuds are better at saying in the ears. Because of their smaller size and weight they don’t move that much. Plus the additional ear wings so common with workout earbuds do a good job at improving the fit. On-ear headphones aren’t bad per se, but do tend to move more easily because they’re bigger and heavier. Sports on-ear headphones tend to clamp harder on your head which makes them very suitable for most sports, just not something crazy like gymnastics. Working out with uncomfortable headphones is a pain in the rear. You probably already know this. Focusing on exercise is hard enough, you don’t need to worry about the uncomfortable headphones as well. In-ear headphones can be very comfortable for most people. There are lots of different ear tips (Comply foam tips are the best) that you can pick from. You can even get your own custom made eartips to maximize comfort to your ears specifically. There’s a wide selection of ear wings that fit most in-ear earbuds which can improve comfort and fit. The only people who shouldn’t use in-ear earbuds are those with shallow ear canals. Some people just can’t get a proper fit because of their ear shape. On-ear headphones fit all people, those with big or small ears. But their one problem is the pressure they create on the ear lobes. Some people have very sensitive ear lobes and can experience discomfort after some time. You can change the cushions/pads which can improve comfort with some models, but not all. On the other hand, if you have shallow ear canal and can’t get a proper fit with in-ear headphones, then on-ear is your only option. Lots of big gyms are very loud. This is why having workout headphones with good noise isolation is very important. You want to focus on your workout and not be bothered by the noise. Noise isolation is a good thing. Unless you need headphones for running outside and need some situational awareness, then you want more noise through. In-ear headphones are very well known to have great noise isolation. Using the right eartips is crucial since they create a tight fit inside the ear canal. But if you want more noise in you can always use smaller eartips that won’t fit so tightly. You can use them for running or working out in loud gyms. On-ear headphones give more flexibility. There are open-back and closed-back on-ear headphones and which ones you pick will determine how good noise isolation is. Open-back design has almost no noise isolation since they are “open”. Closed-back design is the best for noise isolation because the back of the earcups is “closed”. You just need to make sure to pick the right type for your needs. Build-quality is very important for workout headphones. Because you’re always moving there’s a higher chance you accidentally drop or bang them. Quality of materials and water-protection plays an important role. Your sweat can damage the electronics inside. This is why it’s important you get headphones with some kind of sweat resistance. IPX rating is the most common international standard for water-protection. If your headphones have IPX rating they’re most suitable for working out. In-ear headphones (earbuds) can be well built but suffer from the same problems as other types of headphones. Bad materials or bad build-quality can ruin your earbuds very quickly. Wires are a weak point in many cases since you tug and pull them all the time. Generally, there’s no difference in durability in in-ear and on-ear headphones. On-ear headphones can either be well built or badly built. Some are sweat-proof some aren’t. Usually more expensive on-ear headphones have a better build-quality and water-protection compared to cheap models. It’s always a good idea to take good care of your workout headphones. Use a carrying case and don’t expose them to too much water. Since most of us don’t have a gym at home we have to commute there. This is why portability in workout headphones is important. Bigger headphones are harder to carry around but not too much of a problem either. Having a quality carrying case makes everything easier. In-ear headphones are the smallest type so these are the most portable of them all. You can easily pack them in a small pocket in your bag or clothes. Any small carrying case will keep them protected for a long time. On-ear headphones are slightly bigger but not as big as over-ear headphones. 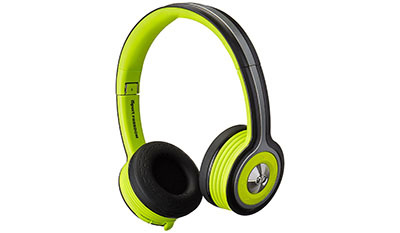 Most of the on-ear workout headphones are foldable and have a carrying case to make it easier. In the end, bigger headphones are harder to carry around. There are many things that can be considered for versatility. The biggest one is getting the right technology for your needs. You can pick wired or wireless workout headphones. There are pros & cons to each but generally better for specific needs. If you workout in a big gym and want freedom to move around, getting wireless Bluetooth headphones is a good idea. There’s less of a chance you’ll damage your headphones since they have no wires. You can move around with freedom and also keep your music device (smartphone) away from gym machines which is safer. You do have to charge them since they use a battery and also expect to pay a higher price. On the other hand, wired headphones have a more basic experience. For running you can keep your music device close in your pocket and run comfortably. But doing yoga might be more of a hassle. There’s no battery that needs to be charged so that’s a plus. It’s a proven, straightforward technology. Both in-ear and on-ear workout headphones can be found in wired or wireless design. Pick the ones that best suit your exercise needs. The thing to keep in mind is that wireless Bluetooth earbuds usually have a smaller battery. This means less battery life and more charging. On the other hand, on-ear headphones generally have a bigger battery with better battery capacity to last you longer. Money and price always come into consideration when buying new headphones. The ratio between price and value can play an important reason for purchase. Thankfully, there are lots of options. You can get very cheap in-ear or on-ear headphones to save money. Though generally, on-ear headphones will usually be slightly more expensive simply because they’re bigger and require more materials. If you like premium headphones than you can easily find more expensive on-ear and in-ear headphones for working out. Audio-quality always plays a role. There’s almost no difference in sound quality if you compare in-ear to on-ear design. In both types you can get balanced, bass-heavy, V-shaped, and any other sound signatures you want. There’s a wide selection on the market. Though, because it’s so easy to change the eartips in earbuds you have more control over sound quality. Getting foam eartips can improve and dramatically change the sound you get from your earbuds. You don’t have this flexibility in on-ear headphones. For a very long time on-ear headphones (supra-aural) were not deemed as the go-to headphones for working out. On-ear headphones have slightly smaller ear cups than over-ear headphones that fit on ears instead of over them. For the gym, the smaller classic earphones and in-ear earbuds reigned supreme. 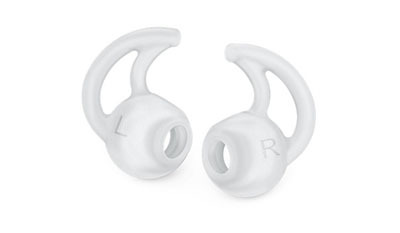 But today it’s much easier to find special on-ear models that were designed specifically for sports and gym. And they are actually a very good alternative. So is there any reason you should get on-ear headphones for working out? The most common reason why people get on-ear headphones instead of in-ear is comfort. Many people can’t comfortably fit in-ear earphones because of their ear shape or shallow ear canal. Their only comfortable alternative is on-ear workout headphones. They can be very comfy with lightweight design and plush earpads. The earpads can many times be removable and washable. You don’t want the stench of your sweat anywhere near you. You’ve probably already tried a couple of in-ear headphones so you know if you have a problem getting a comfortable fit. If you do, on-ear workout headphones can be the solution. You can check the best workout headphones here. When wireless, on-ear headphones usually have a much better battery life. Because they are bigger they can fit a bigger battery. This might be a very important advantage for those who need great battery life. If you’re running long marathons or have all-day trips then wireless earbuds will die on your sooner. But the bigger on-ear wireless pair of headphones will offer more playtime per charge. In-ear headphones have more advantages. Small headphones are often better. This is true for sports headphones. Since you’re moving, more weight is a problem. Smaller earbuds have an easier time staying in ears and giving you a good fit. They’re lighter and easier to carry around than on-ear headphones. While in-ear monitors can be uncomfortable for some people, most people find them very comfy. They are the perfect design for working out because they stay in the ears with more ease. By using ear wings the fit is improved and generally better than with on-ear headphones. A wide selection of ear tips can make any earbuds very comfortable for most people. While there are definitely expensive workout earbuds, in general, they cost less money. This might be because they are a smaller product needing less material. It could also be because they have a lower perceived value by the market. It doesn’t really matter why. The only thing that’s important is that you can expect to get more for your money in in-ear headphones. Like we have concluded in the sections above, the more comfortable workout headphones are generally in-ear headphones. The small and lightweight design and a wide selection of ear tips make them more comfortable. 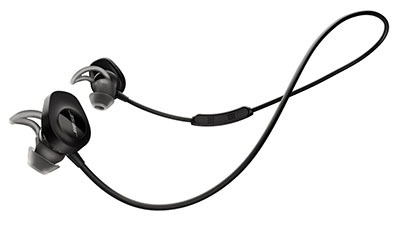 Right now, the most comfortable workout headphones are the Bose SoundSport wireless in-ear earbuds. Using ear wings and fitting eartips will get you the best from both worlds. Good comfort and stable fit. Many workout in-ear headphones offer exactly that. You can find other comfortable headphones for everyday normal use. Wireless workout headphones have one advantage over their wired competition. Wireless headphones offer more flexibility. Since you’re moving during exercise you need to carry as few items as possible. And most people today use smartphones for their music, getting wireless workout headphones can be the perfect choice. You can put your smartphone somewhere nearby so you don’t have to carry it in your pocket. Accidents can happen and you don’t want to increase the chances of damaging your phone if you don’t have to. Small MP3 players still exist but they’re a lot less popular than in the past. It’s just easier to connect wirelessly and not worry about your gear that much. Thankfully, modern wireless headphones have caught up in sound quality and usability with wired models. You can easily find great sounding Bluetooth headphones with good battery life and user experience that are perfect for working out. This doesn’t mean you should always pick Bluetooth, but for most gym situations wireless is the way to go. If you don’t want to worry about charging your battery all the time, you can check the best wired workout headphones. What should you look for in good on-ear workout headphones. The biggest issue with on-ears and sports is their fit. You need the headphones to stick to your head. This can be achieved by strong clamping force or by very lightweight design. Thankfully, there are on-ear headphones that were specifically made for sports. It’s best to first check those as they are more likely to have everything you need. Sweat is another big enemy of headphones. To use any headphones for working out they need to have some kind of sweat protection. This is many times claimed by the manufacturer as being “Sweat-proof” or “Sweat-resistant”. Many times they even tell you the IPX rating for their model. The higher the IPX the better. In case your headphones don’t have any kind of protection against moisture, keep them away from heavy sweat and water. Some have so much water-protection they are actually waterproof headphones. Without fun sound you won’t enjoy your headphones. While the standard for sports headphones is usually a bit lower since you won’t be focusing on sonic fidelity you still want good audio quality. Most people prefer some emphasis on bass which gives you a good rhythm and makes you exercise harder. There many different headphones that offer different sound signatures. Since many gyms are very noisy, good noise isolation in on-ear headphones plays a part. Closed-back design and quality ear pads that don’t leak sound are crucial for good passive noise isolation. If you want to keep the ambient noise away always look for these things. In case you want to hear your environment you need open-back design with bad noise isolation. Running outside can be dangerous so hearing your surroundings is a smart idea. Just in case you need to jump away from a driving car. Do you know the difference between noise isolation and noise cancelling? Check the top noise-cancelling headphones. How does noise cancelling technology actually work? Here’s an interesting article about special headphones that use neuroscience to unlock your athletic potential. These performance improving sports headphones are too expensive for an average user but might be the future. Have we missed any questions regarding on-ear headphones vs earbuds for working out? Let us know in the comments.